In Israel, a land of conflicting voices, the music of the Tabernacle Choir on its recent tour was as one voice helping sound the anthem of peace. The sun’s rays filter through the clouds over Shepherds’ Field near Bethlehem. The bleating of sheep and the occasional clanking of a goat’s bell fill the morning air as a modern-day Bedouin leads his flock over the rocky hill. The sloping field, looking much the same today as it did anciently when angels appeared to shepherds on the night of Christ’s birth, drops down into a valley with steep hills on either side. The hills, terraced with limestone, take on a momentary glow in the intermittent sunlight. Bethlehem, the Savior’s birthplace, sits atop the hill on the right﻿—gleaming a lustrous white, even through the soft, shifting morning haze. Gradually, the valleys and hills surrounding Shepherds’ Field are filled with the strains of “The Lord Is My Shepherd” sung by the Mormon Tabernacle Choir. “The Lord is my Shepherd; no want shall I know. I feed in green pastures; safe-folded I rest.” After the final words of the hymn, “Oh, what shall I ask of thy providence more?” rise strong and clear through the air, the choir stops singing. To everyone’s surprise, the sound continues as a long, lingering echo rolls through the valley and rebounds from hill to hill. The music of the Tabernacle Choir has filled the land, and in turn, it seems that the land is reluctant to let it go. The Tabernacle Choir’s 26 December 1992 to 6 January 1993 tour of the Holy Land, with its concerts in Jerusalem, Tel Aviv, and Haifa, filled the land with music, and the echoes continued as the concerts were broadcast live on Israeli television and radio. Audience reactions and media reviews confirmed that the people were reluctant to let the music go. There are nearly five million Israeli citizens. Of these, 3,950,000 are Jews, and 750,000 are Israeli Arabs, of which 600,000 are Moslems and 150,000 are Christians (primarily Catholic and Greek Orthodox). The centerpiece of the Tabernacle Choir’s trip to Israel was the performance of the Berlioz Requiem with the Jerusalem Symphony Orchestra during its Liturgica 92 concert series. (See sidebar “The Berlioz Requiem,” p. 37.) This series, held in December and January each year, features performances of significant Christian choral or orchestral works. Throughout the Tabernacle Choir’s tour, audience reactions were the best indication of the success of the tour. (See sidebar “The Concert Calendar,” p. 39.) Israel is a country of many musicians, but it is common knowledge that the nation’s sophisticated and educated audiences typically leave immediately after a concert. Following the Berlioz Requiem, the audience reacted to the sheer power and energy of this great music with applause in unison, the call for an encore, for more than five minutes. The most dramatic audience reactions to the choir’s music, however, were at the a cappella concerts, where the choir sang a mixed repertoire of their general fare from Rachmaninoff to African-American spirituals. These concerts began with the audience standing as the choir sang “Hatikvah,” the Israeli national anthem. The music continued to draw audiences in as the choir moved through the first half of the concert, with especially tender audience responses to the combination of “By the Waters of Babylon” followed by “Come, Come, Ye Saints.” During the lively second half of these concerts, some members of the audiences began to lean forward in their seats. When the choir sang “Now Shout!” with the words “Clap your hands,” part of the audiences began to clap with the music. Slight grins grew into wide smiles. Applause grew louder with each succeeding number. By the final number, “Cindy,” with its syncopated rhythm, people in the audiences were tapping their feet, slapping their legs, or nodding their heads in time with the music. The organists and percussionist added the sounds of clopping horses, ringing bells, and a tambourine as the choir clapped and sang, “Get along home, little Cindy, I’ll marry you sometime.” The smiles remained as the audiences applauded, some with their hands held high, until finally they were again clapping in unison. Then the encores began. As the first few notes of the haunting “Jerusalem of Gold” drifted through the concert halls, the audiences gasped, then applauded as the male soloist began to sing in Hebrew. It was easy to feel the audiences’ strong emotional attachment to this song. A woman put her hand over her mouth in ecstasy. A man with a stern face removed his glasses and wept openly. As the song continued, many in the audiences silently mouthed the words with the choir, and others wiped tears from their cheeks. When the song ended, Jerold Ottley directed attention to the composer of “Jerusalem of Gold,” Naomi Shemer, who was in the audience in Jerusalem and also in Tel Aviv. As she rose, the audiences gave her a standing ovation. They were responding to a song that had won their hearts during the 1967 Six-Day War. Based on the legend of a sheikh who gave his wife a miniature model of the city of Jerusalem in gold, the song won a 1967 contest. Constantly on the airwaves and in the hearts of the people during the war, the song became a rallying point for Israeli soldiers and citizens alike as they reentered the previously closed areas of their once-divided city. The applause in unison started again, and the choir began to sing the “Battle Hymn of the Republic.” Near the end of the hymn, the houselights came up, and the audiences began clapping in rhythm with the music until the applause drowned out the end of the song and everyone in the audiences stood up. As the choir began their traditional final encore, “God Be with You,” the audiences remained standing, and many wiped tears from their eyes. This proved to be true at all of the Tabernacle Choir concerts. In each concert, for one synergistic moment, an audience was transformed into something higher than they had been as individuals. The music of the choir wove its sounds with the emotions and memories of each listener, bonding them together into one great unit. And for that brief moment, they were suspended together in peace, held in place by the universal language of music. Applause and houselights gradually allowed reluctant audiences to leave. As they came down the stairs from the balcony or entered the lobby from the main floor, some glowed in silence as they left the building. Others gathered in groups and talked excitedly to one another, seemingly everyone speaking at the same time. Elder James E. Faust of the Quorum of the Twelve Apostles and his wife, Ruth, traveled with the 588 members of the choir, their spouses, and the choir staff in Israel. Elder Jeffrey R. Holland of the Seventy, currently serving as area president of the Europe North Area, and his wife, Pat, joined the choir in Jerusalem. Their presence and leadership contributed to the spiritual dimension of the choir’s tour in Israel. Elders James E. Faust and Jeffrey R. Holland represented Church leadership and traveled with the choir in Israel. The spiritual growth that took place in the hearts of the choir members is an important part of the story of this religious odyssey. “This visit had deep religious significance to us,” says choir president Wendell M. Smoot, “because we viewed our spiritual roots; our Savior was born, lived, and was crucified there. These sites evoked great emotion in us.” In fact, many choir members discovered that “coming unto Christ” was more than a pilgrimage to the Holy Land; it was a journey of the spirit. For choir members and their guests, that journey of the spirit began on December 27, shortly after their arrival in Israel, as they attended a sacrament meeting at the BYU Jerusalem Center. They saw Jerusalem at night as they sat in the center’s auditorium, with its glass walls on three sides. Before them spread a full view of many of the places where Jesus walked, from the road to Bethlehem on the left to the area of Gethsemane on the right. Every facet of the meeting was filled with a strong spirit, from the opening prayer and partaking of the sacrament to the talks by Truman Madsen, director of the Jerusalem Center; Ann Madsen, a faculty member; and Elder Jeffrey R. Holland. Another spiritual highlight came two days later in Haifa in the form of an apostolic blessing. The physical and professional demands had been overwhelming for everyone involved with the tour. The following comments of a choir member are representative of similar stresses experienced by others: “Three months of arduous rehearsals, several performances, a dozen broadcasts, personal preparations for the tour, family Christmas activities, and the death of my mother had taken their toll. When I boarded the plane on December 26, I was utterly exhausted. That’s no way to begin a choir tour.” Then after arriving in Israel, the choir had four major rehearsals, including three rehearsals of the Berlioz Requiem (nearly an hour and a half long) and a rehearsal and a performance of the a cappella concert. Before the choir’s first concert in Haifa, Elder James E. Faust pronounced a blessing upon the group. He blessed them that their bodies would be renewed and that they would have the strength to perform. Though the choir members spent most of their time in rehearsals, concerts, and filming for a television special to be aired this year, the spiritual experiences continued. One special moment for the choir occurred December 28 during a rehearsal at the Jerusalem Center, the first rehearsal with David Shallon, director of the Jerusalem Symphony Orchestra. The choir sat facing the draped front wall of glass in the auditorium, and Mr. Shallon had his back to the windows as he worked with the choir. Partway through the rehearsal, someone pulled open the drapes, giving the choir a view of the old city in the daylight. As Mr. Shallon turned to look, he gave an audible gasp and paused for a moment with his hands together under his chin as he and the choir absorbed the wondrous view. It was a stirring moment for both choir and director. During the concerts, the thrill of singing the Berlioz Requiem and the a cappella concerts filled members of the choir with great emotion and joy. But for at least one choir member, Michael McOmber, singing in Israel had powerful personal meaning. “I sang to Jews, Moslems, Christians, and to my great-grandfather’s brother, John Alexander Clark,” he says. Elder John Clark, who had been called to the Turkish mission in 1894, died of smallpox in 1895 at Haifa, in present-day Israel. He was one of two missionaries buried there who, it seemed, had died in vain. In modern times, however, these graves served as evidence of the Church’s prior presence in Israel and were helpful in its gaining approval for the Jerusalem Center to be built. For many choir members and leaders, the Spirit was strongest as the choir gathered at sites for the filming of the television special. Since the sites were closed to the public during the filming, the choir enjoyed some privacy while they performed as a group. Complications caused the choir to arrive late at the Mount of Beatitudes, with only about an hour of daylight left. By then the sky was slightly overcast as the sun began to set over the Sea of Galilee. Several observers noticed that each time the crews began to film the choir, the sun came out from behind a long, narrow cloud and provided full, warm sunlight﻿—an added testimony of the Lord’s hand in staying the weather for each filming. In fact, the weather was dry and sunny for nearly every day of the choir’s visit. It rained only once, and that was during the night. But the strongest spiritual feelings came for many at the Garden Tomb. Though time was limited for the choir, they still visited many important sites in Israel: Dome of the Rock, the Citadel of David, and other sites in the old city; the Church of the Nativity; the Garden of Gethsemane; the Shrine of the Book; the Orson Hyde Garden; Masada; Qumran; the Dead Sea; and many others. Choir members enjoyed the intellectual and spiritual excitement of visiting these sites. But the visit to Yad Vashem, the memorial dedicated to the memory of those who died in the Holocaust, was an emotional experience for everyone. The Children’s Memorial there had a powerful impact on everyone who entered it. Only a simple darkened room with more than 150 mirrors reflecting the light of one white burning candle, the memorial nevertheless creates in the visitor a feeling of stepping out into deep space. Millions of lights flicker in the darkness, as far as the eye can see above, below, and around the darkened room. Visitors are encased in a womb of remembrance as they hear the names, ages, and birthplaces of some of the 1.5 million Jewish children who died during the Holocaust. Reading alternately in Yiddish, Hebrew, and English, taped voices come over speakers positioned at various levels around the room so that listeners never quite know from which direction the next name will come. A low, mournful cry, which occasionally changes pitch, echoes in the background. Choir members, spouses, and staff meticulously honored this agreement, yet everyone still found plenty to talk about as they visited with the people of Israel. Many gave the people they met a previously approved tape of some of the popular music of the Tabernacle Choir, appropriate for the Israeli people because there were no references to Christ. “We didn’t proselyte. We spoke to them with music,” said one choir member. “We left them our love,” said another. The generous action of a choir member’s spouse brought lasting results. Four choir members and two spouses had taken a taxi to the Hadassah-Hebrew University Medical Centre in Kadesh to see the famous Chagall windows portraying the Twelve Tribes of Israel. “All of Jerusalem is talking about your choir,” said Yocheved, the receptionist. But when asked if she would be attending the final concert that night, she stammered that “complications” would not allow it. Kay Lynn Wakefield learned an important lesson from a woman who worked at the Garden Tomb. “As I entered the Garden Tomb,” Kay Lynn says, “I almost missed the ‘other gardener.’ As we were hurrying along, the sounds of a clear soprano voice filled the air. I felt so drawn to the ethereal sound that I left the crowd and went to find out where it was coming from. And then I saw her! A little English lady sweeping one of the paths in the garden and wearing a dark green sweatshirt that said ‘Other Gardener’ on the back. I knew I had to meet her. And so the music of the Tabernacle Choir filled Israel for ten short days, and, in turn, Israel seemed reluctant to let the music go. Like the lingering echo at Shepherds’ Field, the music of the choir continues to be heard in homes throughout the land as families play tapes of the choir and listen to radio and television rebroadcasts. Represented in the ten sections of this Catholic mass for the dead are musical descriptions of the moment of death, the day of judgment, redemption, and resurrection. The original score for this monumental piece calls for a 210-voice choir and a large orchestra with 110 stringed instruments, 8 pairs of timpani, a bass drum, 10 pairs of cymbals, and an augmented brass section﻿—with everything doubled or tripled in number, if desired. David Shallon, the music director of the Jerusalem Symphony Orchestra, conducted the combined choir and orchestra. “His charismatic quality drew us to him and made us want to perform,” says choir member Lynn Farrar of the rapport between the choir and Mr. Shallon. In fact, the choir gave him a standing ovation after the first rehearsal. The Berlioz Requiem was performed by the choir and the Jerusalem Symphony Orchestra, under the direction of David Shallon, to sellout crowds in Jerusalem and Tel Aviv. A reception followed the performance of the Berlioz Requiem in Jerusalem, with prominent community leaders in attendance. A cappella concerts under the direction of Jerold Ottley, music director and conductor, and Donald Ripplinger, associate director, were performed by the Tabernacle Choir to full houses in the 3,680-seat Binyanei Ha‘Ooma Convention Center in Jerusalem, the 2,100-seat Fredric R. Mann Auditorium in Tel Aviv, and the 1,172-seat Haifa Auditorium in Haifa. Organists John Longhurst, Clay Christiansen, and Richard L. Elliott accompanied the choir on piano and synthesizer. Ron Brough, from Brigham Young University, accompanied the choir on percussion. (These concerts were referred to on the tour as a cappella concerts because they were performed without an orchestra.) In addition, the choir performed an a cappella concert at the Jerusalem Center for invited guests from the area, including members of the Christian and Palestinian communities, with a reception held prior to the concert. 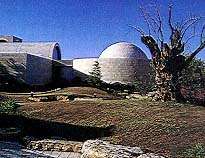 In order to maintain sixty-four years of continuous broadcasting, “Music and the Spoken Word” originated from the Jerusalem Center on Thursday, 31 December 1992. 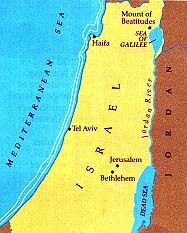 The taped broadcast aired in North America on 3 January 1993, and it was also transmitted throughout Israel. It was produced under the direction of Brother Payne, who was assisted by radio and television crews from the Israel Broadcasting Authority. The planning and logistics of this tour were under the direction of choir president Wendell M. Smoot, business manager Udell E. Poulsen, and administrative assistant Herold L. Gregory. Ensign: Did the choir have any specific challenges preparing for the tour? Jerold Ottley: The staff and choir were under great duress simply because it was the third major tour in eighteen months. And we struggled with the Requiem. It’s a very difficult work which the choir had never done before. It required a different mind-set for the choir because of the long choruses and long phrases. In addition, it’s in Latin. Vocally, it’s very difficult because it is high for many voices and it requires a lot of full voice for long periods of time. There’s only one solo in the entire work, so the choir is on stage and working all the way through. Ensign: How did you prepare for the vocal demands? Jerold Ottley: JoAnn Ottley, our vocal coach, prepared the choir by holding special workshops to build choir members’ vocal strength. They learned to maximize the resonance for the effort produced and that they shouldn’t try to sing every note. Then they learned relaxation techniques for the few moments they were not singing. Also, JoAnn counseled them to save their voices by not laughing loudly or talking too much. The keys to surviving this kind of grueling schedule are a sense of humor and flexibility. In Tel Aviv we were running late, so the choir had a rehearsal at the restaurant between the salad course and the entrée. They just stood at their places and JoAnn led them in exercises to warm up their voices. Then they sat down and finished their entrée, but they had to skip their dessert. Ensign: What adjustments did you have to make when selecting the music for the a cappella concerts? Jerold Ottley: We had to draw exclusively on things from the Old Testament. In the Jewish culture, you never speak the name Jehovah aloud, so you don’t sing it, either. It’s too sacred. We complied with that tradition. And we had to be sensitive to singing for a non-Christian audience. For instance, when we sang “God Be with You Till We Meet Again,” we could sing the word God because that is not necessarily a reference to Christ. But in the chorus, instead of singing “Till we meet at Jesus’s feet,” we sang “Till we meet at our Redeemer’s feet.” The word Redeemer is all right because it is an Old Testament name. We had to go through every lyric and make those kinds of adjustments. Ensign: In how many languages did you sing on the tour? Jerold Ottley: We sang in Russian, Hebrew, Arabic, Latin, German, and English. As usual, we did it all with Lingua Tone, a method developed and copyrighted by our own Dennis Mead. With it, the choir can learn to sing in another language without actually knowing the language, and their accent is generally excellent. Anciently, Isaiah wrote, “Speak ye comfortably to Jerusalem.” (Isa. 40:2.) Music, the language that transcends all barriers, is certainly the language the Tabernacle Choir used to “speak comfortably” to Israel during this concert tour. Knowing that Israel is a country of enthusiastic music lovers, Iain B. McKay, director of international media relations for Bonneville Communications, recognized the importance of making the music of the choir available to everyone. Radio and television broadcasts are an important source of music for those living in Israel and the surrounding area. Therefore, Iain’s meeting in Jerusalem with Avi Hanani, head of music for the Israel Broadcasting Authority (the umbrella organization for Israeli radio and television, and the Jerusalem Symphony), was a very important event. Mr. Hanani proceeded to tell them about his own experience at Temple Square thirty-two years earlier. During the summer, his family toured the western United States and stopped at Salt Lake City. A music student, sixteen-year-old Avi got up early the next morning to visit the Tabernacle and hear the Tabernacle Choir’s broadcast of “Music and the Spoken Word.” When he got there, all the doors were locked, but he could see through a window that the choir was rehearsing. Timidly, he began knocking on each door, and at about the fifth door an usher opened it. Avi simply said, “I am a music student from Jerusalem and I’d like to hear the choir.” At that point, the usher could have told the young man to come back later. Instead, he invited him in. The rehearsal stopped, and Richard P. Condie, the conductor of the choir, shook hands with Avi, introduced him to the choir, and invited him to sit in one of the empty choir seats and listen. When the rehearsal ended, someone took Avi to the front row of the Tabernacle, where he sat next to Church officials during the broadcast. “Mr. Hanani told me, with some emotion, that that was one of his most profound musical experiences as a young man,” says Brother McKay. “And then Mr. Hanani asked, ‘What can I do for you?’ I said that Mayor Teddy Kollek had invited the Tabernacle Choir to come to Israel. Mr. Hanani replied, ‘Well, we must have them on Israeli broadcasting.’ And I said, ‘That’s what we’re here to discuss.’” This meeting opened the door for the outstanding media support of the Tabernacle Choir’s concerts in Israel. During the week of December 10, Israel Television sent their North American Bureau chief, Yair A. Stern, to Salt Lake City to record interviews with Church and choir officials and to film the choir in rehearsal. Accompanying him was Avi Granot, counselor for church affairs from the Embassy of Israel in Washington, D.C.
During the choir’s tour, both the Berlioz Requiem and the a cappella concert performed in the Binyanei Ha‘Ooma Convention Center in Jerusalem were broadcast live on the Israel Radio network. Both performances were also recorded by Israel Television for broadcast on a delayed basis. 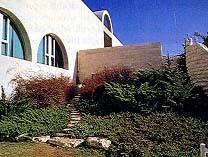 Oren Schindel, head of the director’s department at Israel Television, supervised the television coverage. He said, “The word is that whatever Bonneville and the choir want, the answer is yes.” The broadcasts were also received in countries bordering Israel, with a potential audience of millions in Jordan, Lebanon, Syria, and Egypt. A large, gnarled olive tree stands in the sunlight near the entrance of Brigham Young University’s Jerusalem Center for Near Eastern Studies; the tree’s dark, twisted limbs provide a stark contrast to the glistening white stone of the center. Though the tree looks dead compared to the green grass at its base, it is not. A closer look at the 800-year-old tree, moved here from Galilee, reveals shoots coming out of its weathered trunk. Olive trees, whose roots can live for centuries, are among the most enduring of plants, and this one serves as a reminder to those who see it that when we sink our roots deep into the truths taught by the Savior, we can be nourished by the gospel and reach toward eternal life. Four views of BYU’s Jerusalem Center. Visitors approaching the center first notice the 800-year-old olive tree. They enter a secluded garden with fountains and the peaceful sound of running water, and then move into a long, high gallery area filled with reflected light and warmth. The arches of the Jerusalem Center are visible on the horizon near the center of this photograph of Jerusalem. The Jerusalem Center, overlooking the old city, is located on the southernmost part of Mount Scopus, a northern extension of the Mount of Olives. The 120,000-square-foot building sits on four and one-half acres. Its seven levels span a steep 100-foot drop. With classrooms, a library, a multipurpose room, a cafeteria and dining room, two auditoriums, and dormitory rooms for 175 students, the center was designed by Franklin T. Ferguson of the firm of Fowler, Ferguson, Kingston, and Ruben, architects in Salt Lake City, in cooperation with David Reznik, associate architect of David Reznik Architects in Jerusalem. This was “a collaboration of friendship,” says Frank Ferguson of the joint venture. The architectural message of this building is light and peace. Unlike any other architecture in Jerusalem, the windowed auditorium invites in the view of the old city of Jerusalem. At night, when viewed from across the valley, the lighted building with its layers of arched windows looks like a lantern on the hill. 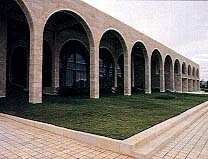 The multiple arches of the center, such as these across the front of the auditorium, repeat an architectural design that is common in Jerusalem. Marble and teakwood cover many of the surfaces inside the center, and Jerusalem stone covers the outside. 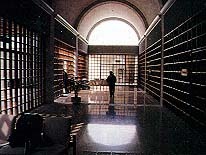 Today, Brigham Young University students are free to study at the Jerusalem Center for Near Eastern Studies. It is, indeed, a light on a hill for those students, who come to gain knowledge and sink their spiritual roots deep into the enduring truths of the gospel and life of Christ. Architecturally, it is also a light on a hill as its arched presence sits high on Mount Scopus and whispers peace to the city below. The Tabernacle Choir, tenor Robert Breault, and the Jerusalem Symphony Orchestra, all under the direction of David Shallon, performed the Berlioz Requiem in Jerusalem (upper left) and Tel Aviv (above). Anxious to hear the choir, audiences such as this one in Jerusalem (upper right) not only filled every seat; many people also sat on the stairs and stood along the walls. Above: The lights of the old city, seen through one of the three glass walls of the 330-seat auditorium of BYU’s Jerusalem Center, provide a dramatic backdrop for the choir’s a cappella concert there. Upper left: Donald Ripplinger conducts the a cappella concert at Haifa as soloists Dan Knudsen and Beth Monson perform “Hymns of Praise.” Upper right: The faces of enraptured concert-goers like this woman tell their own story. Upper left: The flag of Israel, adopted in October 1948, is based on the design of the tallith or prayer shawl﻿—a white background with two blue horizontal stripes. Centered between the stripes is the Shield of David, also in blue. Above and upper left: The warm light of the sun setting over the Sea of Galilee illuminates the faces of the Tabernacle Choir as they sing on a windy bluff on the Mount of Beatitudes. Upper right: Both men and women serve in the Israeli military when they turn eighteen years old﻿—women for two years, men for three. Lower right: The choir rehearses for the Berlioz Requiem in the Tabernacle in Salt Lake City, Utah.